Open the recent National Human Development Report (nhdr), or any glossy document of the World Bank and its ilk, and it will reveal how the world is a much better place. Death rates have declined, people live longer, fewer children are dying and incomes are increasing. Of course, forget the places that are in the grip of wars and disasters. Barring them, all's well. So how does one explain the increase in the cases of asthma, cancer, learning disabilities, obesity and diabetes. They persist because governments have preferred to remain oblivious. 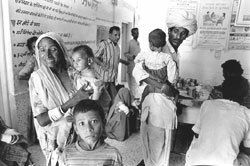 The Indian government does not collect or publish data concerning the health of children. It just simply does not care. And if you think the scourge extends only to the poor, the marginalised and the already suffering -- you couldn't be more wrong. Asthma affects the rich more than the poor. So does obesity and diabetes in India. Even childhood anaemia is more prevalent in the better-off states, according to the nhdr. The Planning Commission has no explanations for this. Cancer registries that are sporadically produced once in a decade do not track areas and communities where these cases originate. "Cancers are not tracked because the focus is to provide curative and surgical solutions to the patients," says Delhi-based cancer surgeon Anish Goyal. "In the West, tracking birth defects, cancers and mapping their origins, linking them to possible causes are done so that trends can be established, based on which investments are made. This foresight is absent in India," says H N Billimoria. "Research on children will happen only there is strong evidence of a causal link. In the absence of research little is done to invest in establishing such links. This is true of the West," says Sue Brenner of the International Network for Promoting Children's Health based in Toronto, Canada. She points out that drug development and health research focuses only on drugs that are largely lifestyle-related diseases because rich countries can pay for them. It is not profitable to invest in research and manufacture vaccines for malaria and cholera. There are drugs for cancer, asthma and diabetes since only the rich can afford them. "Tropical diseases will remain neglected if the current trends in drug development continue. Investments will increase specially for lifestyle-related diseases like obesity, asthma and diabetes," says Francois Salle of the Mdecins Sans Frontires, who has been championing the cause for neglected diseases at international forums. Investments too in programmes on children's health is decreasing. According to a report by the United Nations Foundation, international programme assistance has shrunk by 20 per cent since the last decade and south Asia has the least share -- about us $ 110 million. The Indian Council of Medical Research (icmr), India's apex medical research body, has no clear strategy for health, let alone children's health. Ranbir Singh, spokesperson of icmr, says that there is no research allocation earmarked for children's health." Still, it published an advertisement in national dailies claiming it had made "giant strides in medical research". It is another matter that most of its programmes have been going on for several years, without any substantive results. It's performance has been criticised by the governments' own watchdog, the Comptroller and Auditor General of India (cag). It is frightening how public health is governed in this country. With no vision and strategy. Children lack a voice. They can't lobby or fight against governments, corrupt corporate and powerful bureaucrats. The initiative lies with parents and civil society to give children the chance to live in a safer world. It is also time to push governments to secure a cleaner environment.